This kit has everything you need for the ceramic shell process including the Shellspen Suspension. 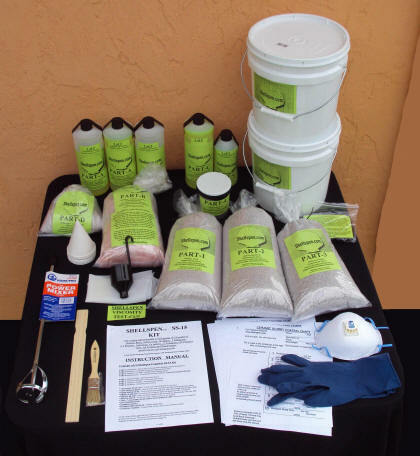 It is a two‑part formula for the Slurry, Pre‑wet liquid, 3 grades of stucco, Refractory cement, Viscosity Test Cup, Mixing Blade, Working Manual and Coating Charts. ( Must keep from Freezing ) Shipping weight 28.6 Kilograms / 63 Pounds. NOTE: OUR WEBSITE IS CHANGING AND WE WILL HAVE AUTOMATED SHIPPING FOR THE SS-5 AND SS-15 SHELLSPEN COMPLETE KITS SOON! Shipping weights are approximate, and kit prices are subject to change without notice. If there is a price change on a kit, you will be notified before payment. Thank you while we complete these updates.